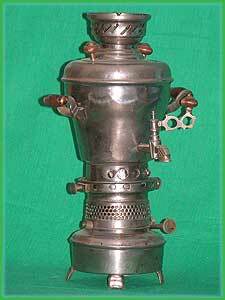 Travel (picnic) samovar. “FRAGMENTED TEAPOT”, brass. Collection. Antique. Body – in a form of oval teapot fragmented by ten vertical shares. 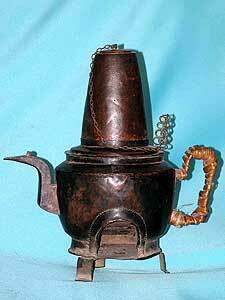 A pipe with a handle was bought to complete set of samovar. Choke – two: first – front, in a form of semi sphere for water supplying mouth, second – rear, in a round form for cone belt brazier tube. Both chokes are with wooden knobs on their posts. Crown – simple form, without cuttings. Cover – the upper plate of the body, irremovable. Round – as curved and soldered edge of the upper plate of the body. Holders – one, curved strip with bent into edges, soldered in two points – upper and bottom to the rear side of the body. Crane – as usual teapot spout, in a form of letter “S”. Ash-pit – as round cuttings on the cylindrical part of the ash-shut. Legs – four, as curved brass strips, soldered to the bottom of the body. Ash-shut – bayoneted in a form of a hat with its crown downwards, fastens to the bottom part of the body by hat’s brim in grooves between a surface of the body and three soldered to it rectangular holders. Height: 215 mm. Width: 250 mm. 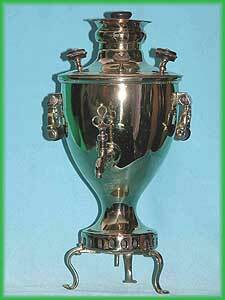 Samovar “Vase in a form of a wine-glass”, “NORBLIN’s EGOIST”, silver-plated copper. Collection. Antique. Manufacturer: trademark on the bottom of the base: «in a circle – “N” - lower in an oval - NORBLIN and Co - on the center - GALW - lower - WARSZAWA - below than an oval – “23”. Body – in a form of a wine-glass, face side ornamented by applique of two symmetric angels from the center, supporting a flower garland. Choke – punched, with metal knob on its post. Crown – complicated form, with patterned cuttings. Holders – cast, two Byzantian vertical handles of independent double fastening by figured platforms everyone, ornamented by curls, hold two figured cylindrical ivory handles on tack. Crane – cast, of the simple form with two soldered belts from the bound delays, with a pith key and openwork flat vertical handle, with bone knob above. Ash-pit – as patterned cuttings on the cylindrical part of the post of the base. Base – punched, round, with some steps forming a cone post of the base. Legs – three, in a form of lion’s paws, soldered to the bottom edge of the base. Stuff, technique: silver-plated copper, inner and external silvering, with black noble oxide, chasing, caulking, punching, soldering, brazing, assembling, ivory turning and cutting. Height: 265 mm. Width: 140 mm. 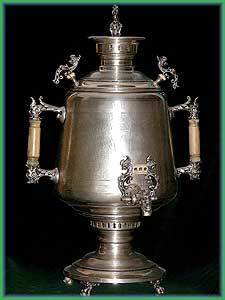 Samovar “Vase in a form of cup (goblet)”, “LOP-EARED. SLANTING TUBE”, copper – brass combination. Collection. Antique. 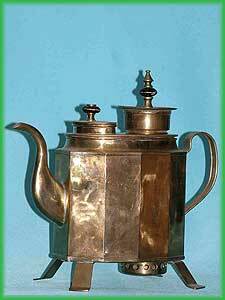 Manufacturer: trademark is absent, at that time samovars were rare branded. Body – copper, in a form of cup (goblet). The brazier tube installed at angle of 75o for better draw (as then thought). Cover – copper, punched, with round wooden knob on its post and steam exhaust valve with round wooden knob above. Holders – two bent vertical of independent double fastening everyone, are made of an oval copper strip (one of holders - left if to look at a forward side of the body - it was replaced; right - original). Crane – brass, cast, simple form, with a cone brass key and openwork flat vertical handle. Ash-pit – as patterned cuttings on cylindrical part of the post of the base. Base – brass, cast, square. With brass post narrowed in middle part. Legs – four, the lower endings of the base. Stuff, technique: copper, brass, chasing, caulking, punching, soldering, brazing, tinning, assembling; wood turning and cutting. Height: 280 mm. Width: 270 mm. 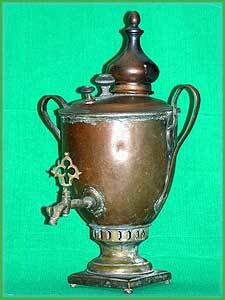 Restoration: there is no removable copper draught tube (chimney) and a choke to complete set of this samovar. 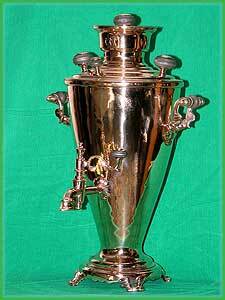 Samovar “Vase in a form of pear”, “SMALL KEROSENE PEAR”, very rare device, nickel – plated brass. “Component part of collection branch - kerosene samovars”. Collection.Antique. Body – in a form of pear with prominent segments. Cover – simple punched form with two wooden round knobs on their posts and a steam exhaust valve. Crane – cast, simple form, with cone key and flat figure handle with wooden knob above. Ash-pit – as a grid with round cuttings. Stuff, technique: nickel – plated brass, chasing, caulking, punching, soldering, brazing, tinning, assembling; micas, wooden turning and cutting. Height: 305 mm. Width: 190 mm. Samovar “Vase in a form of a pear with patterned fragments”, “MISTRESS”, nickel-plated brass. Collection. Antique. Manufacturer: rubbed trademark on a cover: two images of a medal with an inscription above them: « … middle Asia …. (above one) and … in MOSCOW …. (above another) ». Manufacturing time: ~ third - last quarter of XIX century. Body – in a form of pear with patterned fragments. Lower part of the body has a sphere form with a narrowed neck above, there is a prominent patterned bulge (belt) in the middle part of the neck. Choke – punched, in a form of hip with ivory knob on its post. Crown – complicated form, with openwork cuttings in a form of hearts. Cover – punched, smooth, with two ivory egg-shape knobs on their posts and steam exhaust valve. Round – cast, patterned by ornaments. Holders –four, cast, openwork patterned pieces, curved as letter “S”, like horn up each, decorated by tendrils platforms brazing to the body, with two figure ivory round handles, each is embraced between two horns on tack fastened by two screw-nuts on endings of tack. Crane – cast, complicated form, soldered to the body. Has a cone key with cast patterned by tendrils handle with round ivory knob above. Ash-pit – as openwork cuttings, in a form of hearts at the middle bulge of the post of the base. Base – cast, octahedral, with high fragmented by sides post, having middle bulge. Legs – four, as tendril leaves at corners, lug a little forward, consist of three parts and assembled with screw to fasten parts of legs and an additional bottom plate to the lower part of the base . Ash-shut – round cover with a knob and catch, fastened by hinge to the additional bottom plate of the base. Stuff, technique: nickel-plated brass, inner tinning, chasing, caulking, punching, soldering, brazing, assembling; ivory turning and cutting. Height: 530 mm. Width: 370 mm. 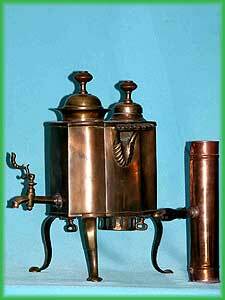 A samovar “ Three-legged travel (picnic) samovar”, oblong, with semicircular dredging on corners, brass, with demountable legs, in patina. Collection. Antiques. Time of manufacturing: ~ middle of XIX century. The manufacturer - is unknown, the brand is absent. Body – in a form of a rectangular with semicircular dredging on corners so at the top view at the body it is under the form of somewhat reminiscent to a cross . Choke (rear) ––simple configuration with wooden round knob on its post. Choke (front) for water pouring with bell mouth - simple configuration with wooden round knob on its post, a little large size then rear choke. Round – smooth, curved edge of upper plate. Holders – cast, two, in a form of “so called – “cockleshells”, with patterned lower platform, brazing to the body, with figure patterned upper platform – “cockleshells” with wooden plate as thermo isolator threaded by two screws to the bottom of the “shell” part of holder. Crane – cast, simple form with a cone key and vertical patterned handle (branch). Ash-pit – patterned cuttings on the ash-shut in a form of a hat with its brim up and crown downwards. Legs – cast, three (two in frontal part and one at rear part of the body), curved as a letter “S”, removable, attached to the body in grooves between a surface of the body and three leg’s holder (each soldered to the bottom of the body) by three screws, which head have the form of an flat oval with internal cutting. Ash-shut – bayoneted in a form of a hat with its crown downwards, fastens to the bottom part of the body by hat’s brim in grooves between a surface of the body and the holder of a back demountable leg on the one hand, and between a surface of the body and the soldered rectangular holder of the ash-shut with another. Stuff, technique: brass, chasing, caulking, punching, soldering, brazing, assembling; wood turning and cutting. Capacity: ~ 1, 25 litters. Height: 300 mm. Width: 210 mm, along a longitudinal axis - 270 mm. Сoffee pot, “Сoffee Pot : BUMBLEBEE WITH SNAKE PATTERN”. German silver, all surface of the body is covered by patterned ornament in a form of snakes. “Component part of collection branch – COFFEE POTS”. Silvering on the body is completely erased, a little silvering remained on the crane, legs, on a spirit-lamp silvering is well kept. Collection. Antiques. « Отъ служащихъ трактира “ Московскiи Сокольники “. Body - of a design remaining a cylindrical body of wasp - two cylindrical capacities having in an average part a narrow waist. In front of capacity are connected among themselves by a drainage tube of small diameter. A small diameter pipe on the top of the front side of upper cylinder is served as steam exhaust. All surface of the device covered by with patterned ornaments in a form of snakes produced by special technological operation. Put on the upper smooth ring soldered to three legs. Cover – flat, covered by with patterned ornaments in a form of snakes, with ivory knob on its post. Upper cover - simple form of pipe in upper part in a form of a month, by design is a container for just-milled coffee, submitted inside and on a bottom with tube to lift boiling water up from the bottom cylinder of the body in top of cover and forming a geyser mechanism for coffee preparation with the boiled water. Covered by with patterned ornaments in a form of snakes. Holders – two lateral holders with two horns up each, everyone of independent brazing to the body by the patterned semicircular platforms, hold two cylindrical ivory handles, each on the tack , strapped outside by screw-nuts. Crane – cast, simple form with a cone key and flat figured openwork branch (little broken) above. Base – two smooth rings soldered to three legs on upper and middle part of them. A cylindrical spirit lamp with a wick and ivory handle, mounted on the ring soldered to the middle part of legs. Legs – cast, three concave curved. Stuff, technique: silver-plated German silver, special technological operation to produce surface with patterned ornament, inner silvering, chasing, caulking, punching, soldering, brazing, assembling; wick, ivory turning and cutting. Height: 415 mm. Width (in the widest part): 205 mm. 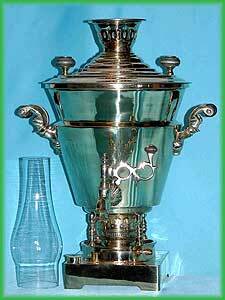 Samovar “Vase in a form of wine-glass ”, “CLASSIC CHESS-QUEEN ”. Collection. Antiques. The manufacturer - a brand on a cover « Two prints of one medal - in the centre - the image of a artillery gun - from above an inscription - FACTORY B.G.TEJLE - an inscription from below - FABR. MARK ». Body – in a form of a wine-glass with punched convexo-concave pattern in a form of spoons. The lower part of the body has a small sphere with vertical shares. Such design of the body called “Chess - Queen”. Choke – complicated configuration of hip with wooden round knob on its post. Crown – of complicated form with patterned cuttings. Cover – simple punched form of two-step hip, with two wooden round knobs on their posts and with steam exhaust valve. Round – cast a figured ornament of balls on perimeter. Holders – two, openwork pieces with carved platform of each brazing to the body by it, with two figure wooden round handles, each between two horns up and on two tacks fastened by four figure screw-nuts on endings of each tack. Crane – cast, figure, with spout like high-boot by design and with the top inflow for deduction of water-strainer. Crane submitted by cone key and figure vertical branch with wooden round knob on its post above. Ash-pit – with the same as on the crown patterned cuttings. Legs – four at each corner of the base, patterned in a form of animal paws, lugged a little forward, the lower component part of the base. Ash-shut – round cover with handle. Capacity: ~ 7, 5 litters. Height: 600 mm. Width (in the widest part): 410 mm. A samovar "Vase", « GUN with MONSTERS », German silver. Silvered. All surface covered by patterned ornaments. Collection. Antiques. The manufacturer - a brand on an edge of a cover - « PLEWKIEWICZ - WARSZAWA - M ». Manufacturing time: ~ second half XIX centuries. Body – standard samovar vase in the form of a smooth artillery gun (a cone truncated in narrow top and rounded in wide bottom part, both decorated with flower pattern) with front medallion and monogram "SM" between two vertical strips. All surface covered by patterned ornaments of flowers. Choke – simple configuration of hip with cast figure in the form of the letter "S" with bone round knob on its post. Cover – simple punched form of two-step hip, with two cast figures in the form of the letter "S" with bone round knobs on their posts, without steam exhaust valve. All surface covered by patterned ornaments of flowers. Holders – four cast as heads of monsters vertical lateral handles, independent fastening to the body everyone, hold two vertical ivory handles on tacks. Crane – cast, figure, cast figured, having horizontal key in an average part like metal bow consist of two parts as two cast figures in the form of the letter "S" each and the carved bone handle between them. Plums of the crane it is executed as a head of a monster. Base – cast, round in the form of hip. All surface covered by patterned ornaments of flowers. Legs – four, soldered to the bottom edge of the base, patterned in a form of animal paws, taking spheres, figured legs. Legs lugged a little forward. Ash-shut – round cup, fastened to the bottom of the base with its handle. Stuff, technique: German silver, silvering, special technological operation to produce surface with patterned ornament, chasing, caulking, punching, soldering, brazing, tinning, assembling; ivory, turning and cutting. Capacity: ~ 6, 5 litters. Height: 535 mm. Width (in the widest part): 380 mm. 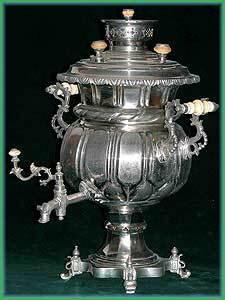 Samovar “Vase with medallions, double ash-pits”, “VORONTSOV BROTHERS ”, tombac. Collection. Antique. Manufacturer: trademark on a face side of the base: from above « HONOUR. CITIZEN», on the center: the print of the trade mark, four images of two medals, on the right - a print of the trade mark, is lower: « the BROTHER. VORONTSOVS ». Body – vase with medallions, with double ash-pits. Cover – simple form with two wooden round knobs on their posts and a steam exhaust valve. Round - cast and patterned by small spheres along the perimeter of the round . Holders – cast, two, each with two vertical horns and patterned platform of brazing to the body, with figure wooden round handle, each between two horns, and on tack fastened by two figure screw-nuts on endings of tack. Crane – cast, patterned form, with cone key and patterned openwork figure handle, with wooden round knob above. Base – cast, square. Post of the base is high, narrowed in the middle part between two ash-pits. Legs – four, hart of the base, lugs a little. Stuff, technique: tombac, chasing, caulking, punching, soldering, brazing, tinning, assembling; wood turning and cutting. Height: 410 mm. Width: 330 mm. 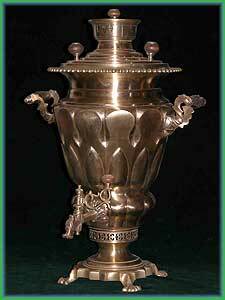 A samovar “Vase in a form of cup (goblet) with low mounted ash-pit ”, "LAND MINE", a brass. Collection. Antiques. The manufacturer - no brand. Time of manufacturing: ~ the first-second quarter of XIX century. Body – in a form of a cup (goblet), under the form reminding an aviation land mine. The bottom part of the body smoothly passes in the narrowed post of the base which, extending from bottom, passes in cylindrical punched base with ash-pit . Crown –figure form with figure cuttings. Cover –punched simple form with two wooden round knobs on their posts and a steam exhaust valve with wooden round knob on its post. Holders – cast, two, in a form of figure ear-rings, with two wooden handles on tacks, each joined by short tack to square platform of brazing to the body. Crane – cast, patterned form, with cone key and vertical patterned figure handle. Base – round, with figure cuttings for ash-pit. Legs – patterned three, in a form of letter «S», soldered to the bottom of the base. Height: 400 mm. Width: 310 mm. 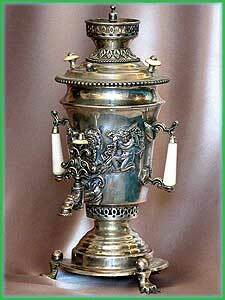 Samovar « Vase in a form of cup (goblet)», "STOCKING", tombac. Collection. Antiques. The manufacturer - a brand on a cover - unreadable. Time of manufacturing: ~ first-second quarter of XIX century. Body – in a form of a cup (goblet). The bottom part of the body being narrowed smoothly passes in the post of the base which, extending from bottom, passes in the round cast base. Cover –punched simple form with two wooden round knobs on their posts and a steam exhaust valve with wooden quick. Holders – cast, two with four vertical horns in the form of the letter "S" and patterned platform of each brazing to the body, with two figure wooden round handles, each between two horns, and on two tacks fastened by four figure screw-nuts on endings of tacks. Crane – cast, patterned form, with cone key and vertical patterned figure handle, with wooden round knob above. Legs – patterned four, lower part of the base, a little lug forward, with cuts in the middle part of them. Ash-shut – round cover with catch, fastened by small hinge on the bottom plate of the base. Stuff, technique: copper, tombac, chasing, caulking, punching, soldering, brazing, inner tinning, assembling; wood turning and cutting. Height: 450 mm. Width: 280 mm. 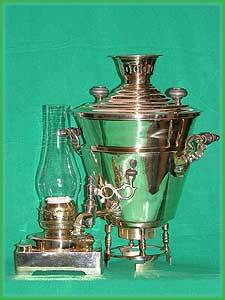 Samovar «Vase in a form of a wine-glass, kerosene», « WINE-GLASS in WINE-GLASS », a brass, kerosene. (the Branch of a collection - KEROSENE). 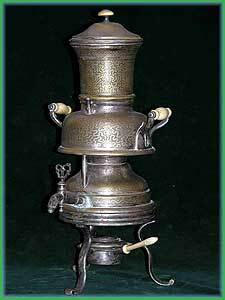 Very rare samovar of double purpose (assignment) - a samovar or a lamp of illumination. Collection. Antiques. The manufacturer - a brand on a cover – half rubbed: at the left two prints of a medal - an inscription: « ВАСИЛIЙ СЕРГЕЕВИЧЪ КОТЫРЕВЪ онъ же БАТАШЕВЪ въ ТУЛЪ » - on the right two prints of a medal. Time of manufacturing: ~ 70-s years of XIX century. Body – in the standard form « a wine-glass in a wine-glass » - a cone with half including in it the second, the same cone. The bottom of the body has lugged pipe which is exactly enter into in a rim of a crown of the mechanism of a kerosene torch. Four figured racks (posts) are soldered to the bottom edge of the body to other party (side) of them the figured fixing ring is soldered also. Crown – of cone form with upper disk (platform) for teapot and with figure cuttings. Crane – cast, patterned form, with cone key and patterned figure handle, with wooden round knob above. Ash-pit – as the cuttings of the bottom part of the crown of the mechanism of kerosene torch. Base – square, flat, 2 inch high hollow brass capacity. The jellied mouth with screwed on fuse is located from above the left first line of the basis. A lugged up brass cylinder soldered to the flat upper part of the base (kerosene capacity) in order to mount to it the figured fixing ring of bottom part of the body. A mechanism of kerosene torch with its crown mounted in center of upper part of the cylinder of the base. 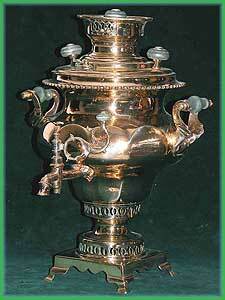 In variant of a samovar - lamps in a rim of a crown of the mechanism of kerosene torch - the glass is inserted above. 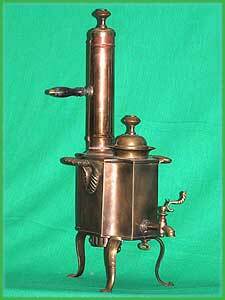 A mechanism of fixing the assembly of the body with the base of the samovar is established on the right part of the cylinder. Legs – the bottom edge of the base hollow copper capacity are the legs. 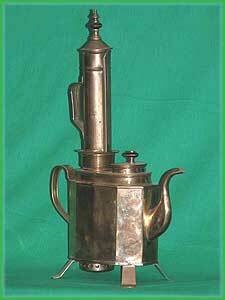 A samovar - teapot. «TEAPOT with the HOLE ». Combned: copper-brass. Collection. Antiques. Spout - is cast, brass in the form of the letter "S", narrowed to the termination (ending). Handle - is made of a copper strip and is braded by a rod; the top part of the handle, extending, like the fish tail, forms a platform, which is clamped by two copper rivets to the body; the bottom part of the handle is soldered and is clamped to the body by one rivet. Choke - in the top part has a decorative overlay and a ringlet as unbent technical stud for fastening it(her) to cover by thin metallic chain. Pipe looks like the letter "L" where the lengthened vertical part of this letter up is narrowed, forming the cone, and the bottom horizontal part and is mentioned above the bottom part the pipe, leaving through a wall of the body outside. In the bottom of vertical part of the pipe, along an axis the «handle – spout», is little bit higher than its(her) bend, six are soldered tacks, carrying out a role of heat lattices. Legs - are three simple copper (asymmetrically) soldered to the bottom of the body as bent copper strips. Material, engineering: copper, brass, chasing, caulking, punching, a stamp, the soldering, mount; braiding by a rod, brazing, tinning, assembling. Capacity ~ 1, 25 л. Height: 225 mm. Width (in the widest part): 245 mm. 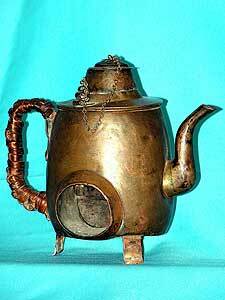 A samovar – tea -pot. «TEAPOT with the HOLE. Pipe as high cone ». Copper. Covered by black oxide. Collection. Antiques. Body – in a form of egg narrowed in the top part before formation cylindrical bent on which the cover is put on. In the bottom cylindrical part of the body perpendicularly axes "spout-handle" the aperture for an out- put(exit) of the bottom, horizontal part of a pipe a few acting as a cone extending for dimensions of the body is executed. This part of the pipe is intended for performance of function of ash-pit (blew), from a cavity formed by this part of a pipe, ashes and the rests of burning of wood also left. Spout – soldered from flat pieces of copper, rectangular in section, in the form of the letter "S", narrowed to the termination; on plum of the spout the folding cover on the hinge is established. Choke - in the top part has a holder for fastening to it the second end of thin metallic chain. Pipe looks like the letter "L" where the lengthened vertical part of this letter up is narrowed, forming a cone, with the length of the pipe approximately equal two lengths of the body towering above it, and the bottom horizontal part and there is a mentioned above bottom part of the pipe, leaving through a wall of the body outside. In the bottom of vertical part of the pipe, along an axis the «handle – spout», is little bit higher than its bend, seven tacks are soldered, carrying out a role of heat lattices. Legs - are three simple bent copper strips (asymmetrically) soldered and clamped by copper rivets to the bottom of the body. Height: 290 mm. Width (in the widest part): 270 mm.